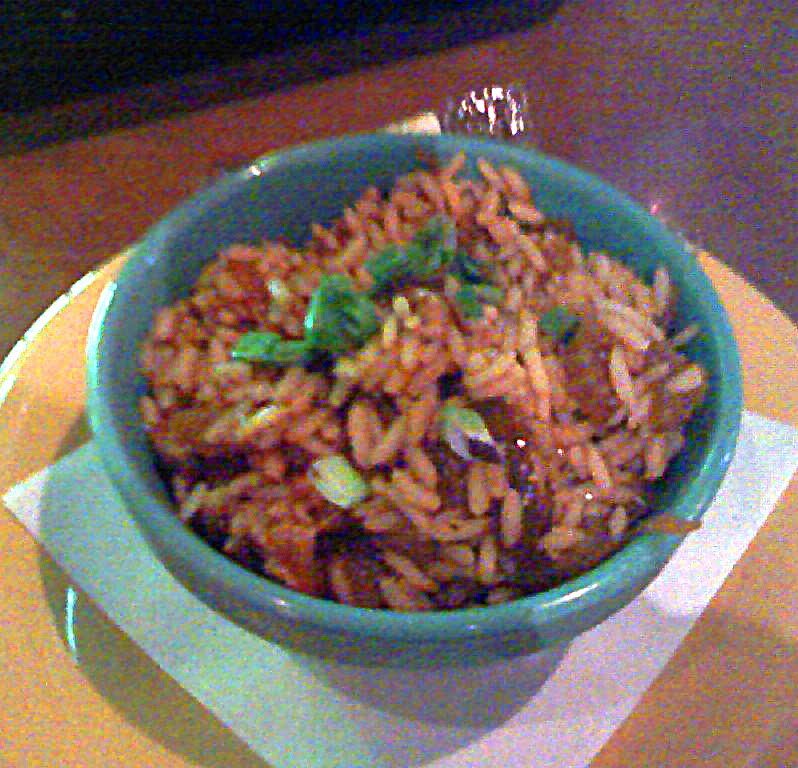 Decent Food For The "Soul"
Recently, I've been visiting Rudabagas, a "Soul Food" restaurant on Cleveland St., near Poplar whenever I had a chance to dine there for lunch (currently, the restaurant isn't open during dinner hours). I did it so I could fulfill my quest to "check-in" via Foursquare to every restaurant that is either in or near my neighborhood. So far, my goal is nearly complete for I only have a few more restaurants to go. Anyway, my experiences at Rudabagas has been good overall, for I have been treated to some decent meals. On my first visit, I decided to get the dark chicken entrée, with the choice of either getting it fried or "smothered." When I saw "smothered," I incorrectly assumed the chicken would be baked and smothered in gravy (that wouldn't have happened if I had read the entire menu, which has baked chicken listed as one of its weekly specials). 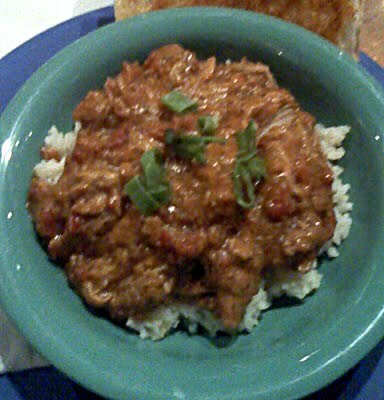 Well, I was half-right, for the gravy (lots of it) was smothered over fried chicken, not baked or grilled. Personally, gravy-smothered fried chicken doesn't work for me, because I don't believe the gravy gets absorbed into the meat as well as grilled and baked chicken. In eating the chicken, I needed a lot of napkins (and a bib) to make eating it palatable, and the chicken was decent, although to get a real sense of how the chicken really tastes, I wanted to try a fried piece sans gravy, which I later did. 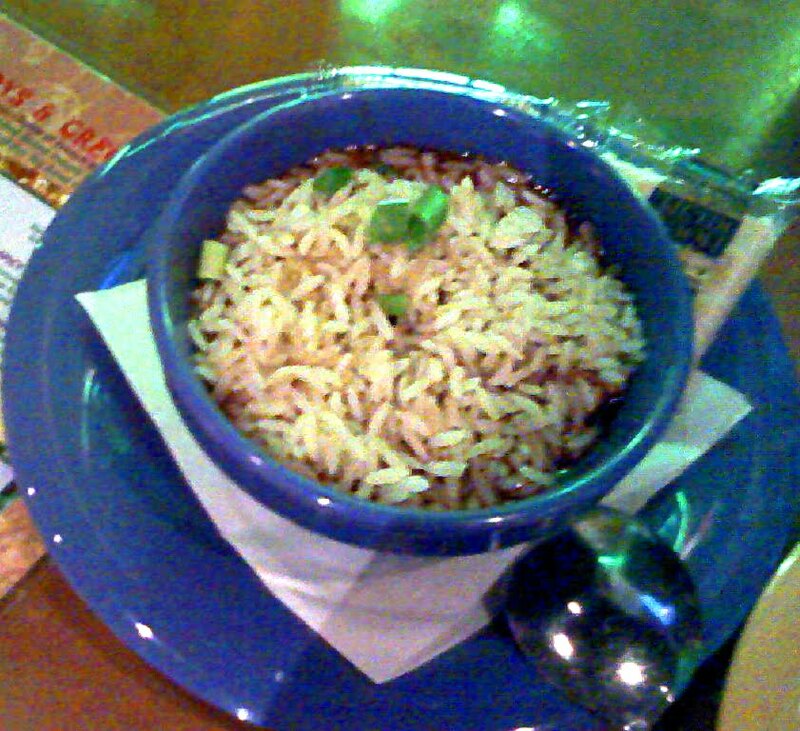 After my first visit, I was anxious to try Rudabagas again. 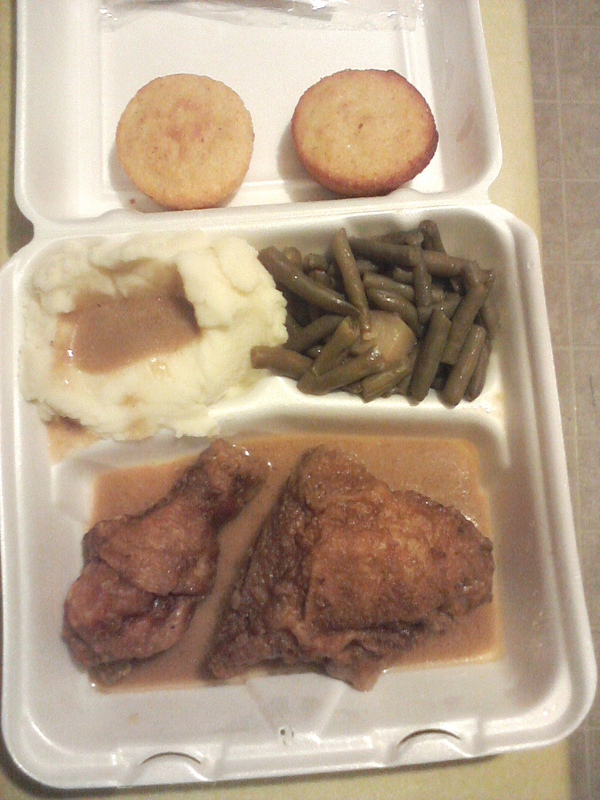 This time, I waited until the following Tuesday when baked chicken was the special for the day. When I got the special, I made sure to order it with green beans and rice and gravy, so I could do a side-by-side comparison with Amoco Food Express, another place where I get this combination. Rudabagas' chicken was extremely tender, and greasy enough that I needed napkins to keep me from making a big mess. The chicken was okay in the sense that it tasted about the same as many other restaurants that serve it (in other words, the chicken's seasoning was average). 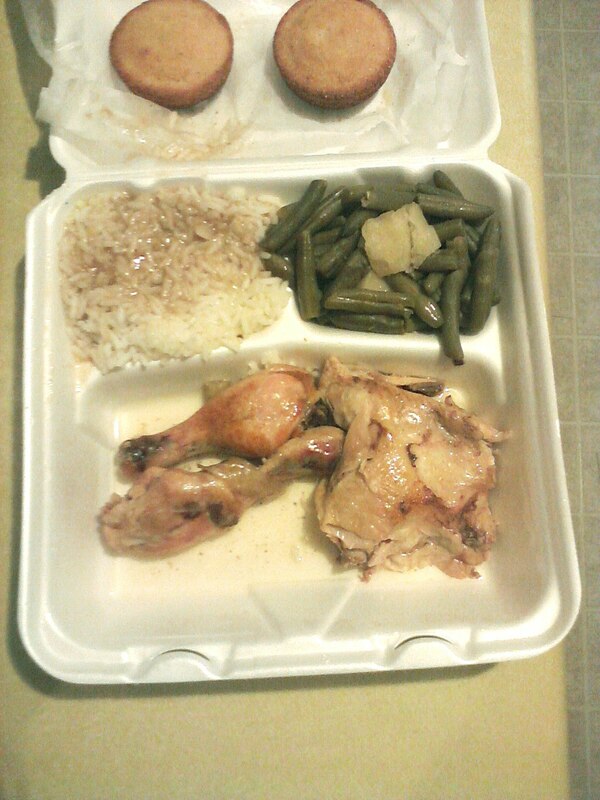 As for the vegetables, the rice and gravy were average and the green beans were great. From what I could ascertain, it seems that the cook added a lot of butter to the green beans that made them taste wonderful. Overall, the baked chicken was good, but not enough to dissuade me from going elsewhere. After getting take-out orders for my first two visits, I decided to eat at the restaurant for my next experience. 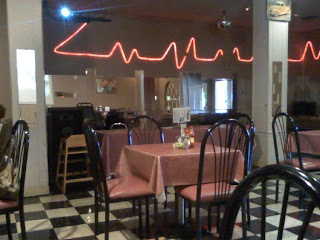 The restaurant has a casual appearance that should appeal to most diners, with jazz music playing in the background. 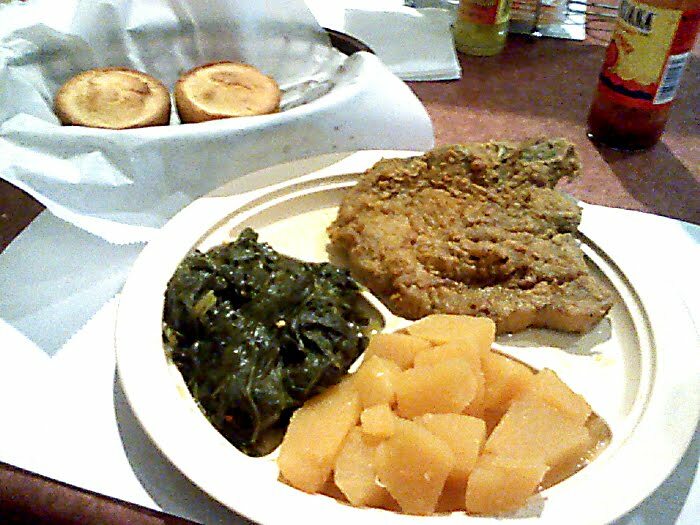 This time around, I decided to get away from poultry and chose the fried pork chops with turnip greens and the restaurant's namesake, rutabagas (the restaurant's spelling of the vegetable is off by a letter). The pork chops were perfectly breaded and seasoned with a nice combination of salt and other spices. The pork chop itself was very tender, to the point that I could've eaten it by hand and not having to floss later. The pork chops meshed well with the rutabagas, which I discovered is a type of turnip that is much sweeter than what I'm accustomed to. If Rudabagas ever decided to make rutabaga greens, it would likely taste much better than the turnip greens that I ordered. Before I go further, I must admit that I'm not a fan of turnip greens (except my Mom's), and most places that serve it uses salt and meats such as ham hocks for seasonings that doesn't appeal to me. With so many restaurants cooking turnip greens this way, I am probably in the wrong with my assessment, so don't take this as a put-down of it. 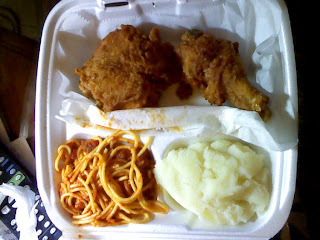 Overall, the meal was decent that made me more anxious to try the fried chicken, sans gravy. As a side note, the waiter who served me didn't do a good job of checking on me after he took my order. In fact, the extent of the service that I got from him was only the taking of my order and the serving of my food. The waiter didn't even notice that my glass of unsweetened tea was empty, and I had to pay for my meal at the restaurant's lunch counter. With that kind of service, I was inclined to give an appropriate "reward" but because I'm not a douchebag, I decided to give the guy a $2 tip. However, for future trips to Rudabagas, I will strictly stick to take-out. After trying the fried chicken "smothered" and the pork chops without gravy, I was very curious about how good the fried chicken was "unsmothered." 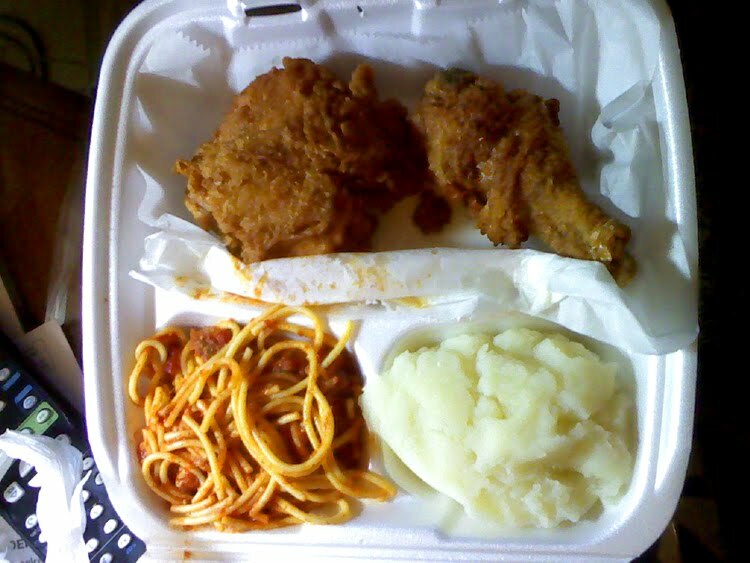 The fried chicken, with mashed potatoes (no gravy) and spaghetti, tasted like most places where fried chicken is served, such as the nearby Kroger grocery store. The breading was saltier, more flaky and less greasy than the pork chops, while the meat was tender and well cooked. As fried chicken goes, it was decent, yet not exceptional. The same can be said for both the mashed potatoes and the marinara-style spaghetti. Overall, it was a good meal that could hold it's own with most restaurants in town, but it's far from outstanding. After a few visits, my assessment of Rudabagas is that it is good restaurant that serves decent Southern/Soul Food cuisine at decent prices. 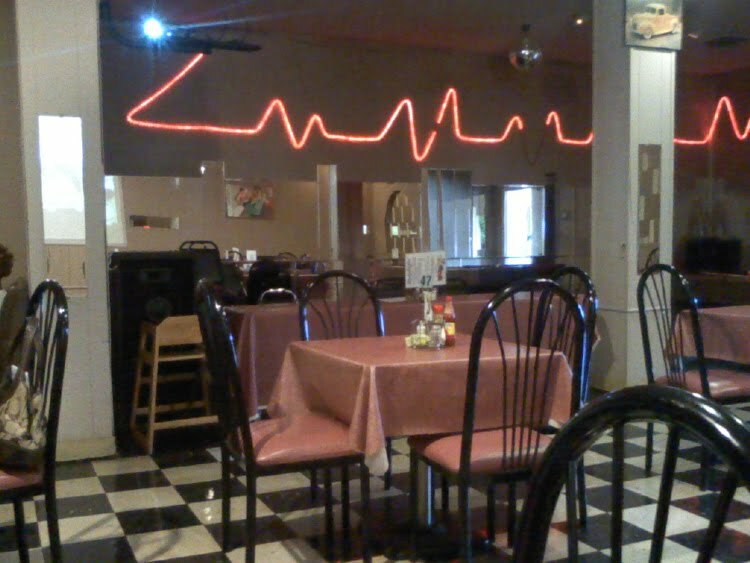 In addition to chicken and pork chops, the restaurant also serves meat loaf, turkey necks, beef liver and chopped steaks everyday, and salmon croquettes and fried catfish as weekly specials. 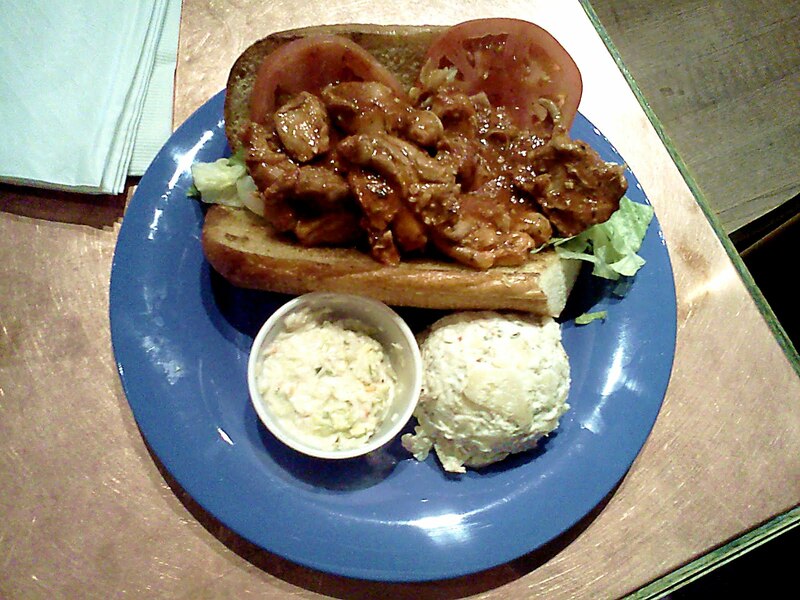 For those working in Midtown Memphis looking for a nice alternative to either fast food or better known restaurants to eat lunch at, Rudabagas isn't a bad choice. The restaurant is very prompt in fulfilling orders, but for those who want to dine-in, don't expect much from the waitstaff. In particular, I really liked the fried pork chops, green beans and rutabagas, so much so that I personally recommend the menu items as a combo meal. In closing, Rudabagas is definitely worth giving a try, and although it may not be the best restaurant that a person could visit, it's far from the worst that shouldn't disappoint.